I have a whole section devoted to talking to the dead including seances, ouija, psychomanteum, and EVP sessions in the Gothic Halloween chapter in my new book Adult Halloween: Taking Back the Season! Seances have a super creep factor. The fact that a group of people sit down at a table, turn out lights, talk to the dead, and await a reaction is about spooky as it can get. It is sort of the bonfire effect, when you huddle around a campfire, tell stories, while your back is to the darkness. 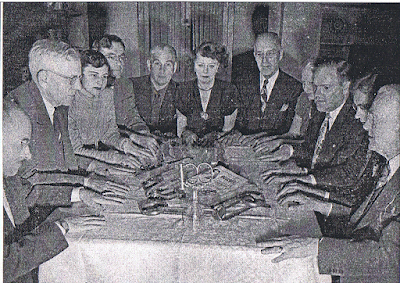 It takes some bravery to face a completely unknown situation, as each seance takes its own turn. When I was a kid, the estate I grew up in was over 200 years old and had been used as a Civil War hospital (book). It had a great deal of ghostly activity. 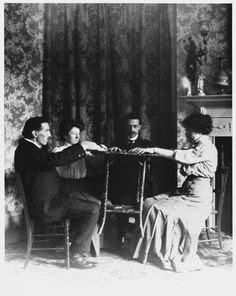 I never understood the attraction by mediums to come and do seances and the TV station coming to film about the ghosts and newspaper reporters covering the events in the house. 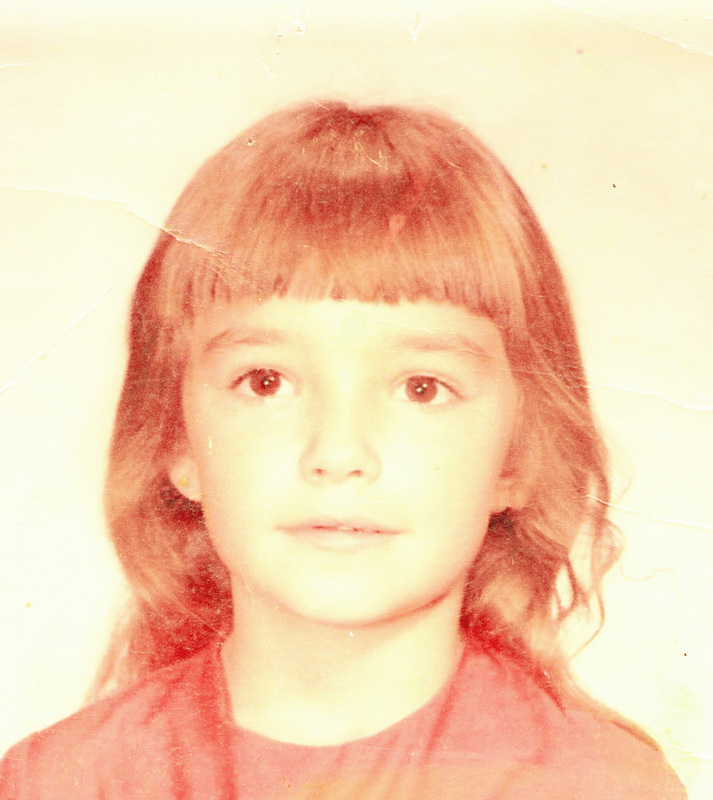 To a child growing up since babyhood in such an environment, it was simply the way the world was, not unusual, just natural. But, we did have some very interesting responses during seances held in the house. One time, when I was small, my siblings went and stayed in one of the cottages out back on the grounds with an adult who lived there. 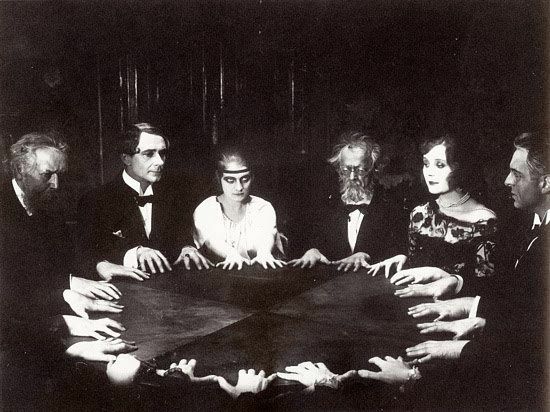 My parents had a medium and some friends over for a seance, figuring they would try and see if anything in the house wanted to move on. The front parlor was draped with blankets and a table was set out with candles. I woke up from a sound sleep to find my sister wasn't in the room, so I wandered downstairs. I saw the blanket on the doorway between the dining room and front room. I came over quietly and lifted the blanket to see the adults around the table, faces aglow from candlelight, with a very serious expression on their faces. I assumed they were doing something religious as it reminded me of the tone during mass at church. So, I quietly dropped the blanket and tiptoed back to the stairs. The medium came out with my mother from the front room and I backed away, afraid I might be in trouble. But she squatted down and held my hands and looked at me and said, "oh look, she has the sight." "The double-lobed ear. She's one of us." The older woman smiled. I had a lot of people point out my heart-shaped earlobe on the left as a kid and I usually wore my hair to cover it up. I was lucky to be taken on by a few mentors as a kid and learned much about seances. Over the years when I grew into adulthood, I made some subtle shifts in how I performed seances to account for factors that I knew as a psychic would give a better chance of success. I discuss this in my book about to be published, Adult Halloween: Taking Back the Season! The Victorian Era certainly had ectoplasm and trumpets, table tilting and the like as great theatrics, but bells and whistles are not a part of a true seance. A good medium certainly helps but the very people placed at the table can up the chances of good communication. Parlor tricks aside, communicating with the dead can take on many methods from Ouija and seance to Psychomanteum and EVP sessions (all discussed in my book). The most common, however, is the simple practice of most grieving people, to sit down and have a talk at the graveside or in moments of great distress. How do you know they are with you? If you call upon your loved ones when you are in a heightened emotional state and you suddenly feel a strange calm, similar to how a dog might feel when petted, then you likely got the connection and received the contact. The Victorian Era ushered in a fascination for the macabre and speaking to the other side, but it also brought photographic trickery to the public as another favorite obsession. The Cottingley Fairies were one fine example of that. 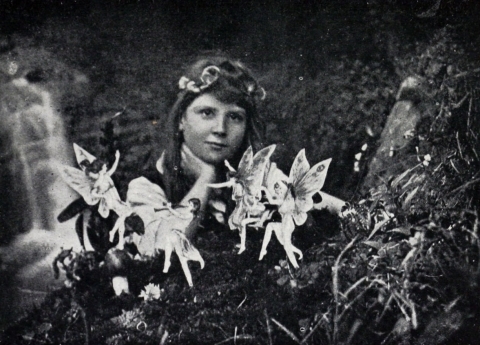 In England in 1917 two photos were taken of some girls supposedly interacting with fairies. 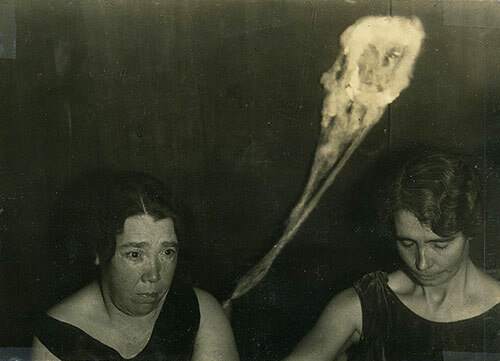 Here are some classic photos portraying ectoplasm (photo trickery and sometimes created with cheesecloth, gauze and other substances. 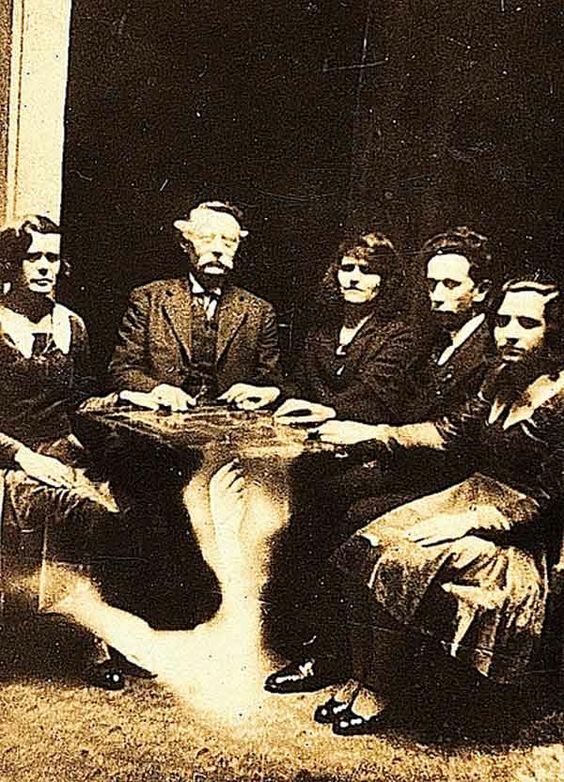 Cassadaga, Florida was founded in the late 1800s as a community for psychics. It became a spiritualists' camp and many came to work their skills and practice. Today, the camp has a hotel and spiritualist classes and studies. Seances in the Victorian Era utilized many theatrical tools. Let's look at a few. Ectoplasm: Said to be the substance ghosts were made of. 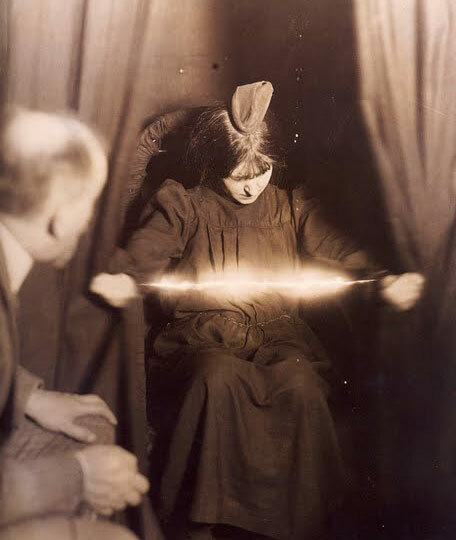 The medium utilized either trick photography in some cases, but more often in a live seance, they utilized gauze, flour, cheesecloth and other substances and made it appear to exude from them. Automatic writing: The medium allowed the spirit to enter them and with tablet and pencil, began to scribble, write, draw, and more while in a trance state. I have done this myself utilizing a laptop computer and had some truly shocking results. I'm not willing to say anyone entered me, as I was certainly myself, but my mind was definitely on autopilot. The things that were written were not in any format I write in, using terms I had to look up. I believe if a psychic has some talent, it's not hard to gather information from the universe, not necessarily from a spirit, just as we can predict a plane crash or know things about strangers. 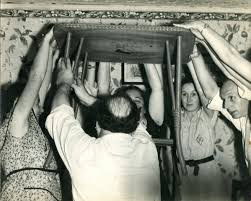 Table Tipping: This was also called table turning or table tapping. The medium would have everyone put their hands on the table and ask questions. If the table tapped, tilted, or turned on a certain letter that was called out, it was noted - sort of like Ouija. Levitation: Levitating items in the room was a popular trick utilized by the mediums and their helpers. It didn't take much in a dim room to produce a floating object or even a glimmer of a spirit (person dressed in costume) to show itself. Trumpets: These lightweight metal cones were set on a table and supposedly utilized and moved by the spirits. Sadly, the entire industry was rebuked by the faking that was so prevalent. Whenever there is a trend like this, the opportunists will jump on it. We have seen much the same in the ghost investigating industry today when it became a popular sport thanks to television shows. 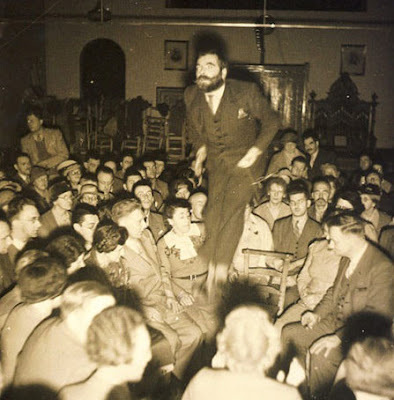 It's sad that the practice of seances have taken on a joke factor, as there is something to be said about a group of people coming together for a common purpose that is driven by the soul - just as church can have amazing effects. It still comes down to - extraordinary feats are likely just that. Seances are much more subtle, much more enlightening, and when the people leave, they don't remember the theatrics, they remember the feeling they had when their souls were tapped for a brief moment in time. There have been several movies with great seance scenes in them and I will recommend those. They are ideal for a dark candlelit movie watching night.